These two together can be an answer to big worldly subjects and create a way of dividing food that is much more equal. Besides that the plant based kitchen is very effective in using natural sources, cuts out a lot of animal suffering and is very supportive to the human body. In 2012 Mark Kulsdom and I developed the Dutch Weed Burger, a 100% plant based burger enriched with seaweed. Again this combination of plant power and seaweed turned out to be a huge success. My friend Roos and I felt a huge possibility here. Because of our love for all those beautiful nuts, grains, legumes, seeds, vegetables, fruit, herbs, and algae that are around, we started to long for making a beautiful book about algae and seaweeds. After a lot of experimentation in the kitchen and taste tests with seaweed, we felt this book should be filled with delicious recipes that would subtly introduce the reader to unique kinds of algae and seaweeds. In a powerful meeting with Marcel Schuttelaar and Koen van Swam of the Northseafarm we developed a way to combine our vision with scientific knowledge from their side: Ocean Greens was born! Besides that this project also turned out to be the first book in which I do most of the photography! 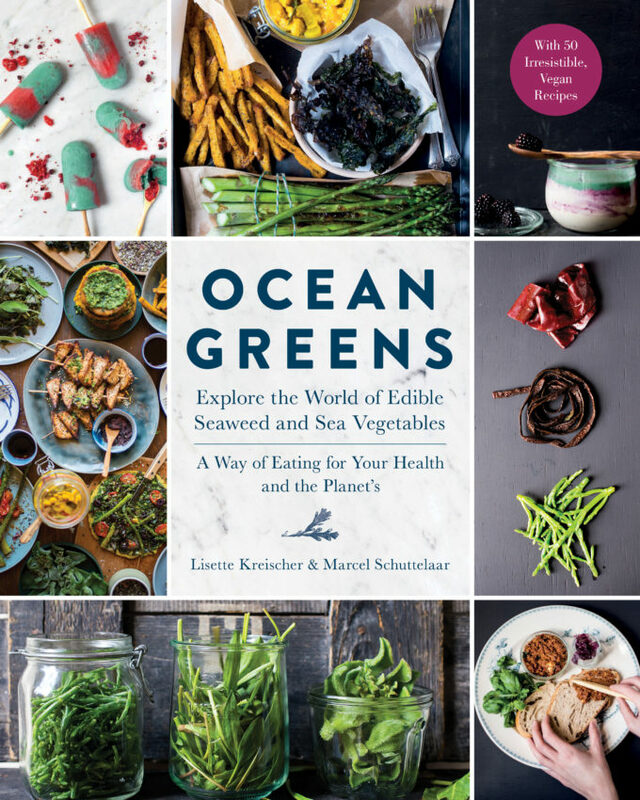 Meanwhile Ocean Greens is completed and it has become a colourful and informative book in which you can read all about seaweed; how it grows, the different kinds and composition, to information about the nutrients and advice on buying and cooking. Of course there are lots of recipes for you to try too, it contains about 50 delicious plant based recipes! This book has been written in Dutch (Groente uit Zee). The German translation, Algen das grosse kochbuch will be released by Umschau in Germany in the fall of 2016. The English edition, Ocean Greens, will be released by The Experiment in the U.S. in October 2016. With this book we want to show that seaweed is a beautiful addition to todays kitchen and that Plant Power is a necessary and delicious part of the future of our food. Finalist IACP Awards – Ocean Greens was one of the 3 finalists for the IACP Awards, in the category Food Matters. The winner was chosen in March 2017, but just to be named a finalist is a BIG success and a huge honor. IACP (International Association of Culinary Professionals) is one of the most prestigious food groups around—their awards are on par with James Beard awards. Finalist Foreward INDIES Book of the Year Award – Chosen from over 2,250 individual entries, Finalists for the Foreword INDIES represent some of the best books from non-Big 5 publishers and authors. Finalists move onto judging by librarians and booksellers. Note for editors: for interviews, images or more information about the book, please contact The Experiment.